Our dog Lady and our cat Cappuccino. Photo taken August 2006, at the horse riding arena in our backyard. Cappuccino liked to walk along under the chain to scratch his back. Lady is in the herding position, herding Cappy. On the 5th of February of this year, I took Cappy to the vet because he was eating only a fraction of his normal amount. An x-ray showed that he had a large tumor in his left lung, which the vet said was undoubtedly cancer. We talked about various procedures for diagnosing what type of cancer it might be; we talked about various treatment options. He was put on an antidepressant to stimulate his appetite, and the vet taught me how to inject subcutaneous fluids. I thought I had time to think over what the next step would be, whether to have an ultrasound to get a diagnosis, whether to go on to chemotherapy if it would be the type of cancer that would respond to chemo. As it turned out, I did not have time to think any of these things over, at all. Cappy rallied for a couple of days, eating normally and being hydrated. But only seven days after that x-ray, on the 12th of February I came home from the Madrona Fiber Arts retreat to find that he was wheezing and couldn't draw a full breath. I tried to rush him to the vet's, but he didn't make it, poor guy. A week later, I took Lady to the family vet. 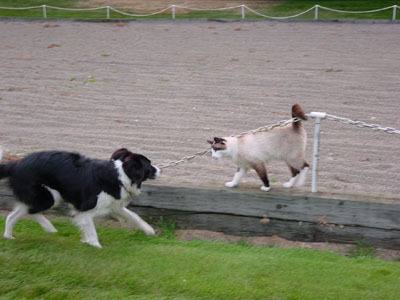 Lady had been limping for as long as Cappy had been sick. I thought she'd torn her cruciate ligament, and at first glance, the vet agreed with me, because that was what Lady's behavior was, tucking her right hind leg up against her body and wheeling around on her three good legs. But then the doctor took x-rays, and came back into the exam room with them, saying, "I didn't even want to show you these." She did not want to be the bearer of even more bad news, after Cappy's death only a few days before. "What will happen? Will they amputate the leg?" I asked. We just did not know, from the x-ray, what we were dealing with. The doctor at that clinic who does surgeries happened to be there on that particular day, happened to be finishing up with one surgery and could do a biopsy on Lady right away before moving on to other appointments in the afternoon. I was still feeling guilty that I hadn't acted decisively enough with Cappuccino, so I just went full steam ahead with Lady, and authorized the surgery for the biopsy that day. After a looong weekend waiting for results, in which I had pretty much convinced myself that she had osteosarcoma and was not long for this world, the results came in on a Monday, and she has the more treatable chondrosarcoma. Similarly, I took the first available appointment with a radiologist to get a CT-scans. And I took the first available appointment with the specialist surgeon who performed the operation on March 11 to remove the tumor. (Even though I have no expertise in reading x-rays, I was not too far off in my guess that the leg would have to be amputated. The cancer was not in her leg at all, and she had a perfectly fine femur and all other bones in her leg were healthy. But the cancer was in her acetabulum, the pelvic bone, and once the tumor was removed, there was not enough bone left to support the leg.) I brought her home from the veterinary hospital yesterday, and now she is resting comfortably here at home, and on a cocktail of three different pain meds. I've had numerous phone conversations and vet visits in the past few weeks. In one of these, the family vet said to me, "Lightning strikes twice. You've had two animals with two very unusual tumors in the space of two weeks." Both of my daughters, independently of each other, have asked me privately what would happen to the amputated leg. I don't know if they thought we were going to bring it home and hang it over the mantel like a trophy, or what.... The answer is that it was sent to the veterinary college at Washington State University for testing. The pathology report will show whether the surgery successfully removed all of the chondrosarcoma. If not, Lady will have to have chemotherapy. I have confidence in the surgeon. Oh, Karen, I am so very sorry about the loss of Cappy. Very glad there is hope for Lady. Sending all healing vibes her way. Oh dear Karen, I am so sorry that you and your family are going through this. Pets are such an integral part of our lives, my heart goes out to you. My condolences to you on your loss of Cappy and my very best wishes for the speedy recovery of Lady. So sorry you've had these two events so close together. The photos are so lovely! I am glad that you have them, and thanks for sharing. I hope Lady is recovering well, and that she doesn't need chemotherapy. 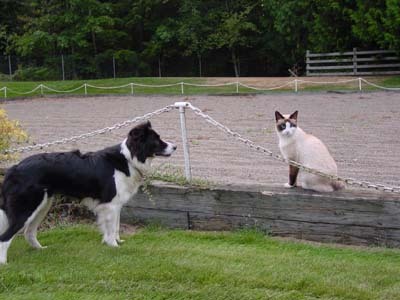 All of you are in my thoughts...and I really appreciate your putting the happy photos up, so that I can think of Cappy and Lady playing together in your beautiful yard. I'm so sorry to hear about the loss of your beloved pet. I hope Lady makes a speedy recovery! I'm so sorry you are going through rough times. Hugs to you and your girls. I'm so sorry to hear about your beloved animals. I have a 19 year old cat that is still very active but have had numerous scares with her. I hope that Lady is doing well.